1 bedroom, 1 bath with pullout couch across from Ole Miss. This quaint, renovated, cottage located across Jackson Ave from Stockard/Martin Dorms and the sorority houses on Rebel Drive is a 1 Bedroom/1 bath ( with shower), with living room, kitchen, and brand new washer/dryer. The step-down bedroom has a Queen bed, pullout couch, satellite and internet. There is a stand alone clothing closet for hanging clothes. The kitchen has a small stove with oven, new refrigerator, microwave, and coffee maker. Just steps from Rebel Drive, behind the Ole Miss Wesley Foundation on Jackson Avenue. This is perfect for couples or individuals attending sporting events, parent's weekend, RUSH/Recruitment, graduation, and activities at the University of MS.
We are a United Methodist Campus ministry, serving the campus of the University of Mississippi. This is owned by the United Methodist Wesley Foundation, with funding supporting this organization and its programming. In a wooded area directly across the street from Rebel Drive at Ole Miss, behind the Ole Miss Wesley Foundation, this quaint cottage is the perfect place to stay. This property has recently been renovated and updated. Great for University Parent Orientations, Graduation, Parent's Weekends, trips to Oxford, MS, Double Decker Festival and more! This great for parents visiting during sorority and fraternity "rush" in the fall, since the cottage is across the street from campus! 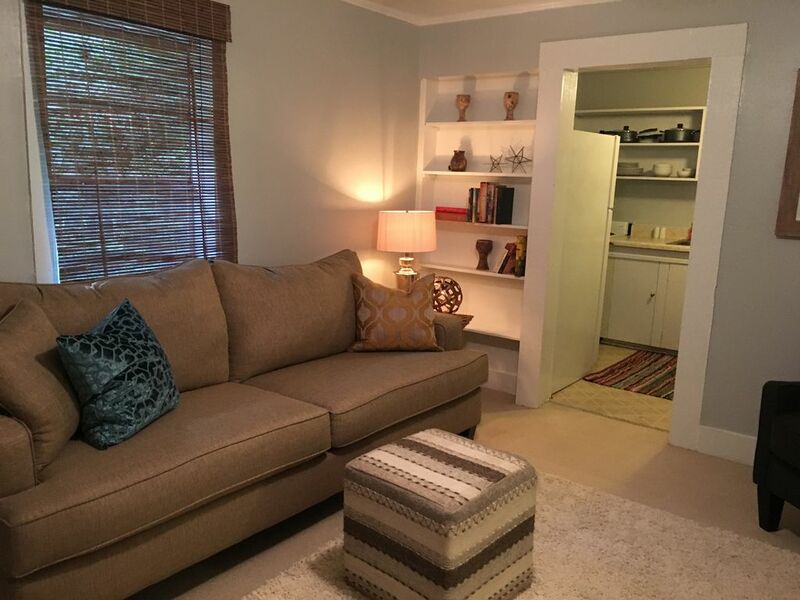 Close to the campus of the University of Mississippi (within walking distance of the Grove and sorority row). Nice living room with a sleeper sofa, two chairs (one is a recliner), and a mounted tv is on the wall. There are a few southern-themed books in the living room bookshelf as well as a few magazines provided. House was perfect for a single guy or a couple. A little rustic but was certainly functional for what was needed. Only negative is that it's really not like a hotel. There's no soap or shampoo. You have to plan ahead for that. Otherwise it was great. Really great location as it's truly close to the sorrority houses. Walkable to everywhere, very comfortable, everything you need is in this cottage! Great location and perfect for our graduation weekend! We’ll be back! Can’t beat the location, we walked to graduation in the grove. Comfy bed and great a/c. We will be back! We are glad you had a great weekend at Ole Miss and would love to have you back anytime the cottage is available! You certainly know how to take care of a rental property. Blessings! Love this cottage! It was the perfect place to stay for Double Decker weekend. It was convenient to all activities, but felt very secluded. We were even able to watch a family of doe play in the front yard! Cottage was clean and nicely decorated! Bed was comfortable, plenty of linens, towels, pillows. Can’t wait to visit again! Perfect location exceptionally close to the campus at Ole Miss! Great location to visit with my daughter for Father-Daughter weekend for her sorority. Full kitchen was a plus. Owner was easy to work with. Easy access. Comfortable and liked the separate bedroom and living room arrangement. Clean, plenty of sheets, towels, blankets. Definitely would stay here again. I cool little place across JACKSON Ave. quiet and quant . Great rental at very reasonable price compared to local hotels . This cottage is clean , and secluded behind the Wesley center . Just a short ride to anywhere in town five stars Eddie !!! Enjoy the sights of Oxford, such as William Faulkner's home, the historical town square, and activities at the University of MS. This is great for orientation visits for parents!